Whitman would also incorporate Doyle’s account of the assassination into a lecture about the death of Lincoln that Whitman delivered almost annually around the anniversary of the incident beginning in April 1879. In 1886, by request, Whitman sent a copy of his lecture with original notes to Bram Stoker, who was an admirer of Whitman since the 1868 release of a selected Poems by Walt Whitman in England, and who would also go on to give his own lectures on Lincoln in the U.S. and Europe. The Harry Ransom Center holds the bound volume of Whitman’s Lincoln lecture notes for Stoker, which will soon be online in a digital collection honoring Whitman’s 200th birthday. 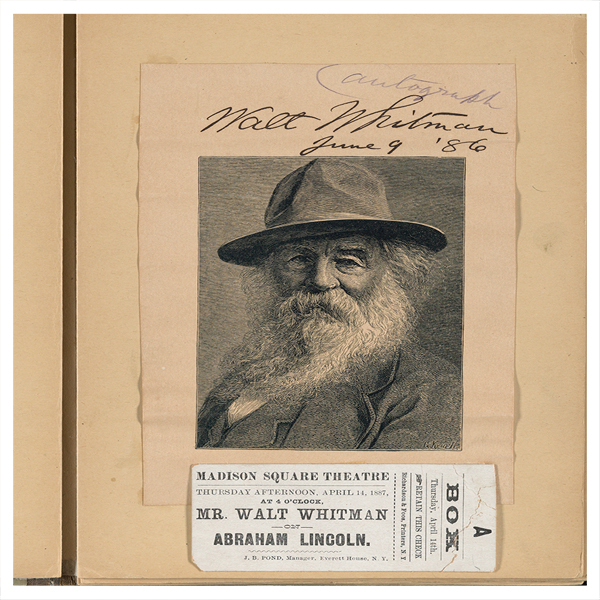 Image: Included as a kind of title page to the bound volume of Whitman’s lecture and notes on Lincoln’s death for Stoker are a print of a portrait of Whitman taken by Napoleon Sarony in New York in 1878 and a box office ticket for Whitman’s most famous delivery of the lecture at Madison Square Theatre in New York on April 14, 1887. Micah Bateman is a fellow in the Andrew W. Mellon Engaged Scholar Initiative and a doctoral candidate in English at The University of Texas at Austin.